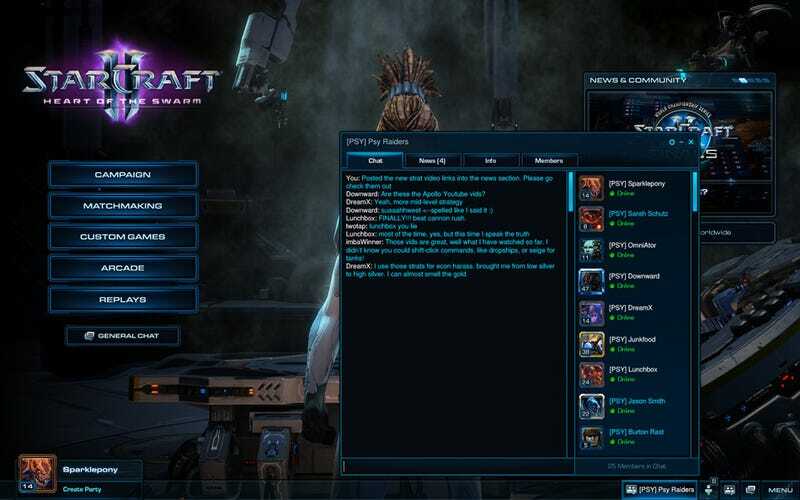 Launching this week as part of a patch for the Heart of the Swarm beta, the new StarCraft II clan system supports group chat, news/announcement sections, officer promotions, and all the other things you might expect a clan system to have. Anyone can make a clan, Blizzard says, and fill it out however he/she would like. The clan interface has four buttons: a private chatroom, a news ticker for clan news, an info section, and a member list. Clan names must be 3-24 characters long, and will be case sensitive, allowing spaces, numbers, periods, apostrophes, and commas. Clan Tags must be 2-4 characters long, and are also case sensitive, allowing spaces, numbers, periods, apostrophes, and commas. Clan names and Tags must adhere to standard name policies. The Clan Tag is automatically pre-pended to a player's name. There is a limit of 50 members per Clan. Our goal with Clans in StarCraft II is simple - we want to bring people together in ways that make sense for allowing players to organize into groups, communicate with each other, and recognize others in-game. Like other new features being tested in the beta, Clans is a work in progress, and we're looking forward to testing it with you. Clans! I for one am looking forward to hearing about all sorts of new clan-based drama.